The annual Open Innovations Startup Tour, the Skolkovo Foundation’s journey across Russia to support tech entrepreneurship in the regions, kicks off Tuesday in the Urals city of Perm. This year, in addition to rewarding the best tech startups in each region visited, the travelling investors and mentors will also be on the lookout for the best female entrepreneurs. "It’s not just a question of how women are perceived, but of how we perceive ourselves,” says Ekaterina Inozemtseva, general director of Skolkovo Forum. Photo: Sk.ru. Every year, regional scientists and entrepreneurs with a tech startup or an idea for one pitch their projects to a jury of experts from the Skolkovo Foundation and its partners, and the winners in three categories – IT, biotech and industrial tech – are selected to take part in the summer Startup Village, a two-day conference and competition for entrepreneurs and investors from all over the world held at the Skolkovo innovation city. This year, the jury will also select the best woman-led project in each city, and that entrepreneur will be invited to take part in the Second Eurasian Women’s Forum, which will be held in St. Petersburg in September. “About 20 percent of the projects submitted [to the Startup Tour] are led by women, and we want to find the best female-led project within the overall competition in each city, and invite the winner to take part in the Second Eurasian Women’s Forum,” said Ekaterina Inozemtseva, general director of Skolkovo Forum, which organizes the Skolkovo Foundation’s events. “We want to gather together outstanding women from all over the country who specialize in the field of tech entrepreneurship,” she told Sk.ru. No less important than the competition section will be discussion sessions in each city devoted to the topic of female entrepreneurship in the digital economy. The Skolkovo Foundation's Pekka Viljakainen. Photo: Sk.ru. “On one hand, the move over to the digital economy makes it possible to equalise, in many ways, the odds for male and female entrepreneurs, through things such as access to information, the opportunity to work remotely, and the speed of data processing: they are fairly basic things, but for many women who don’t have the freedom to go on business trips, or leave home for 12 hours a day to go to work, these things enable them to get closer to the world of male entrepreneurship,” said Inozemtseva. The digitalization of the economy and society means that many professions are changing rapidly or even disappearing, as functions that used to be performed by humans are outsourced to artificial intelligence, robots and automated systems. “Professions that are traditionally dominated by women, such as accountants or textile industry operatives, will simply disappear from the map, because everything will be replaced by automated systems or robotic manufacturing. And this is the problem that needs solving now: where will those million accountants that we have now go?” said Inozemtseva. The aim of the discussion panels, organised in partnership with the Federation Council (the upper chamber of the Russian parliament, whose chair and deputy chair are organizing the Eurasian Women’s Forum) and the women’s division of Opora, a Russian NGO devoted to entrepreneurs, is to find out what women need in order to flourish in the digital economy, and fuel further food for thought for the forum in September. In Russia, 27 percent of entrepreneurs are women, according to Opora’s committee for the development of female entrepreneurship. And while unlike many other countries, Russia has a strong tradition of women working in science and engineering (not least thanks to the Soviet ideology of gender equality), working women continue to face prejudice, said Inozemtseva, pointing out that it remains common practice in Russia for women to be asked by potential employers whether they plan on having children and who will look after those children when the woman is at work. “In that way, it limits people’s opportunity to prove that you can do that job no worse than a man. It’s not just a question of how women are perceived, but of how we perceive ourselves,” she said. “So the more we talk about female entrepreneurship, especially in the conditions of the economy’s transformation, we are showing ourselves that we have the same access to everything around us, we can take the same risks as men, and we have no internal or external barriers to realizing ourselves as female entrepreneurs. Then that new wave of female entrepreneurship will reach a new level,” said Inozemtseva. 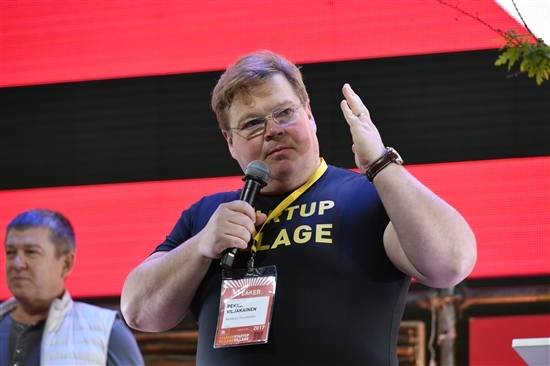 Pekka Viljakainen, an advisor to Skolkovo Foundation president Victor Vekselberg and the driving force behind the Startup Tour, said he strongly supported the move to promote female entrepreneurship. “Based on my observations, in general, of women in business and startups, their probability of succeeding in business is much higher,” Viljakainen, a successful Finnish entrepreneur and investor, told Sk.ru. “Many women – not all, but many – are good with people-related and knowledge-related issues. And entrepreneurship is more and more about leadership, how to handle different types of people, and women are well equipped for that. In Russia specifically, due to cultural and historical reasons, there has been a lack of women in entrepreneurship and leadership positions, and we want to encourage that to happen,” he said. 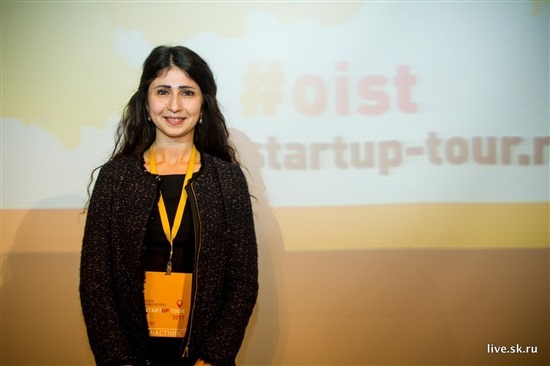 Yana Garazha won the biomed track at last year's Startup Tour in Arkhangelsk with her project to diagnose endometriosis, and went on to win a prize at the Startup Village the following summer. Photo: Sk.ru. One of the winners of last year’s Startup Village was biomed startup Endometrics, headed by Yana Garazha. The project to develop a new testing system for the medical condition endometriosis, which is notoriously slow and difficult to diagnose, won tickets to the Startup Village after taking first prize in the biomed category of the Startup Tour in the northern city of Arkhangelsk last year. This year’s Startup Tour also includes competitions for young innovators aged eight to 19. There will be three age categories: from 8 to twelve, 13-16, and 17 to 19. “I also welcome this initiative wholeheartedly, because there are a lot of youngsters who are willing to start their journey – sometimes on a smaller scale, but to think about business in any case,” said Viljakainen, who started his own business at the age of 13. Just as the mindset that women are not leaders can and needs to be changed, so does the mainstream thinking that teenagers should not start their business before they finish school or perform military service, he said. “In many enterprises, you have to fail first. So the sooner you start entrepreneurship, the sooner you start to fail, and the sooner you will most likely succeed,” said Viljakainen. This year’s Startup Tour begins in Perm on February 6-7, and will call in on the cities of Krasnoyarsk, Yuzhno-Sakhalinsk, Tyumen, Izhevsk, Kaliningrad, Ulyanovsk, Belgorod, Ulan-Ude and Veliky Novgorod, before its final stop in the southern city of Krasnodar on April 24-25. The winners of each category in every city will be invited to the Startup Village, which will take place at the Skolkovo innovation centre on May 31-June 1.